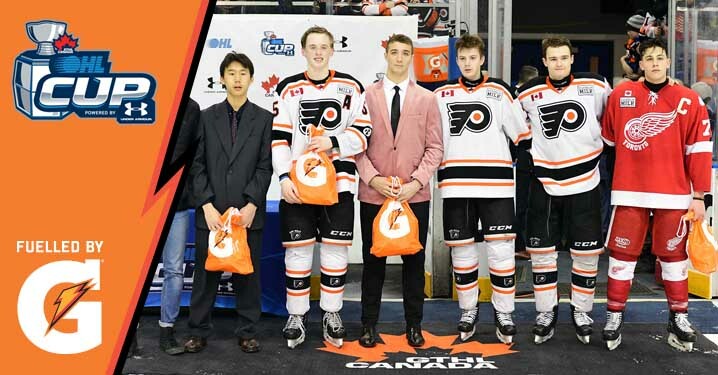 Six players have been named to the 2019 Gatorade OHL Cup All-Star Team, a selection of the annual showcase’s top performers as chosen by OHL Central Scouting. 7 GP, 8 G, 10 A, 18 PTS. 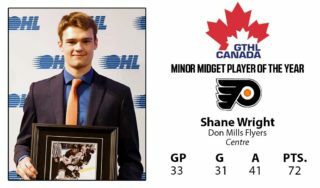 Don Mills Flyers underage forward Shane Wright led all players with 18 points (8-10–18) over seven games, setting up Brennan Othmann for the overtime winner in a 6-5 Championship Final victory over the Toronto Red Wings. Wright had points in all seven contests, starting the tournament with four points in a 6-1 victory over the York-Simcoe Express. 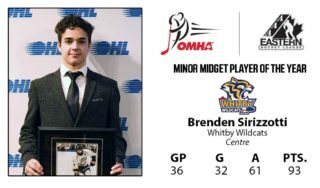 He went on to record four different three-point efforts, netting a hat-trick in a 7-1 semi-final win over the Don Mills Flyers. Wright’s 18 points fall one shy of Connor McDavid’s 2012 showcase record. He led the event with a plus/minus rating of plus-16. 7 GP, 8 G, 6 A, 14 PTS. Don Mills Flyers forward Brennan Othmann netted the overtime winner in a 6-5 Championship Final victory over the Toronto Red Wings. The Pickering, Ont. native tied teammate Shane Wright with eight goals in the showcase, three of which were game winners. Othmann finished with 14 points (8-6–14), recording points in six out his seven outings with three different multi-goal performances. 7 GP, 7 G, 7 A, 14 PTS. Toronto Red Wings captain Francesco Pinelli led his team with 14 points (7-7–14) over seven games, putting up a goal and two assists in a 6-5 overtime Championship Final loss to the Don Mills Flyers. The Stoney Creek, Ont. native recorded points in six of his seven contests, putting up three points on three different occasions. Pinelli netted a hat-trick, scoring the overtime winner in a 5-4 victory over the Kitchener Jr. Rangers to close out the round robin. He had multi-point showings in four consecutive games to close out the showcase. 7 GP, 2 G, 9 A, 11 PTS. Don Mills Flyers defenceman Brandt Clarke helped orchestrate his team’s overtime winner in the OHL Cup Powered by Under Armour Championship Final. 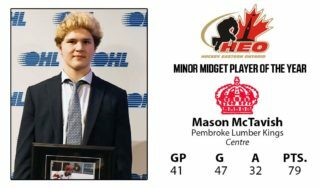 He led all defenders with 11 points (2-9–11) over seven games, surpassing the mark of 10 points set by Roland McKeown (Toronto Marlboros) in 2012 for the most by a defenceman in showcase history. Clarke led the event in shots on goal with 37 and recorded points in six of his seven outings including a pair of three-point efforts. 5 GP, 1 G, 8 A, 9 PTS. Toronto Marlboros blueliner Logan Mailloux finished second in scoring among defenders with nine points (1-8–9) over five games. Mailloux recorded points in four of his five games as the Marlboros saw their undefeated run come to an end in the quarter-final. The 6-foot-3, 215Ib native of Belle River, Ont. 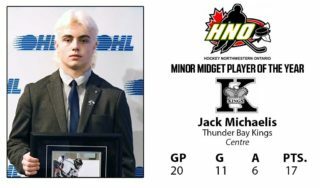 headlined his showcase with three assists in a 6-0 win over the Thunder Bay Kings. Mississauga Rebels goaltender Justin Wu backstopped his team into the semi-finals with a 4-2 record, 1.84 goals-against average, .935 save percentage and one shutout over six games. 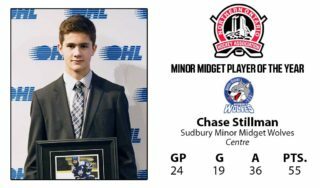 The impressive performance came after he posted a shutout in a 2-0 wild card play-in victory over the Waterloo Wolves. The 5-10, 145Ib. netminder made at least 20 saves in all six contests between the round robin and playoffs, turning aside 39 of 40 shots as the Rebels stunned the Toronto Marlboros in a 4-1 quarter-final victory. Wu led the showcase with 158 saves, helping the wild card entry Rebels reach the semis for the first time since 2012.